According to one of the leading research firms in the space, The Radicati Group, the MS Exchange market is estimated to grow to 470 million mailboxes by the end of the year and 85 percent of this market is still on-premise. * This mission-critical application deserves a stronger and more effective means of management. SolarWinds (NYSE: SWI), a leading provider of powerful and affordable IT management software, today announced its continued commitment to providing greater application visibility to its application and server monitoring software, SolarWinds Server & Application Monitor (SAM). The latest version of SolarWinds SAM shines a light on oft-neglected email management with its new AppInsight for Microsoft Exchange, which empowers sysadmins and Exchange admins to proactively prevent downtime of business-critical email application availability with comprehensive technology that has traditionally only been available in expensive, specialized tools. "Email is a business-critical application for which uptime means all time, and as long as it's running smoothly, management happily ignores IT," said Chris LaPoint, VP Product Management, SolarWinds. 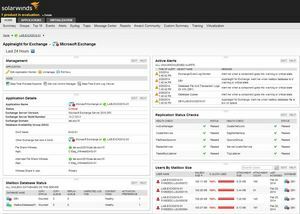 "The new AppInsight for Exchange thus gives sysadmins and Exchange admins a competitive edge by automating previously tedious and time-consuming email management tasks and freeing up that time to focus on the forward-thinking application and IT infrastructure improvements that their bosses want to see to help 'move the needle' for the business -- and all the while, SolarWinds SAM is working to keep email functioning as it should." The new AppInsight for Exchange technology further develops SolarWinds SAM's application management capabilities by integrating with the recently added AppInsight for SQL Server, which provides instant visibility into database performance issues, collectively empowering admins in businesses of all sizes and MSPs to achieve server, hardware, application and database monitoring in a single, powerful solution. Visit SolarWinds' IT Pro community thwack for more information on SolarWinds SAM's new features, including detailed Web services monitoring for APIs such as JSON and SOAP and Windows Scheduled Tasks, which provide at-a-glance access to the state and status of the scheduled tasks configured in a Windows host. SolarWinds Server & Application Monitor pricing starts at $2,995 and includes the first year of maintenance. For more information, including a downloadable, free 30-day evaluation, visit the SolarWinds website or call 866.530.8100.